Thank you for the clear and helpful answers. Fascinating re the design, I assumed they were developed simultaneously. Any update on their regular entry to service? For the most part the 700/707/717 are the same train, however the 717 cab is very different layout due to the emergency stairway. Having been in the 700 and 717 cabs the basic functions are all laid out in a similar place but with a middle 'cover' the then stairs which results in a vastly different cab. 700 can is great for drivers but 717 can not so. But not any choice with that. Last I hear off a reliable source was new year. Currently all efforts are being redirected to ensure December works first. There no 717 diagrams for xmas week anyway so makes sense to push them back to January as it's not needed but proper resourced Decemeber is. Obviously Siemens have broken the back of the issues with the 700s as you would hope and the 707s and 717s seem to have had a smoother early life. The 717s were supposed to have been in service by September last year, so not that smooth. And the irony is that the type with the smoothest entry into service (class 707) may well be out of service by the end of the year. (Unless the 701s that are to replace them suffer the same problems as their class 710 cousins). The 717s were never slated to be service in September 2018. It was always advertised as gradual introduction from LATE Autumn 2018 (always meaning December 9 timetable change) up to early Spring 2019 (meaning mid-March). At least 20 of the 25 units had been delivered before Christmas and are undergoing rigorous testing and driver route and traction training. The remaining 5 units will have been delivered by February. A limited public introductory service has been running on some Friday afternoons since November with a service from Moorgate to Gordon Hill. The only thing that has changed is GTR decided to concentrate all its efforts on timetable stabilisation and enhancement work on the Class 700s and very sensibly decided to delay the additional introduction effort associated with the 717 rollout from December 9 into January or perhaps the start of February. By which time in probability the entire GN Metro service can be '717'nd' in one go! Having ridden a 717 under test and in public service I can promise they are good! 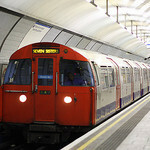 1) The trains run Moorgate - Finsbury Park as ecs and then non-stop to Gordon Hill in passenger service. However they did not stop at Finsbury Park and therefore it is impossible to board them! That to me is not 'in passenger service'. 2) Waiting at Moorgate station the service to Gordon Hill is shown as No.2 on the passenger information display but once the first train has left the station there is a service alteration and the Gordon Hill train is leap-frogged by another longer distance train operated by a 313. On one occasion I spent so long waiting for this specific train that I breached the journey time limit on my Oystercard*. In the end I approached a member of staff in the office who looked through his system and told me that he could not see that train anywhere so therefore it must have been cancelled. Fortunately to get back home I did not need to visit a ticket hall - instead I used one of the free-standing card readers which are deep underground and intended for passengers interchanging between LU and GN services with paper tickets that are only valid on the GN trains. From what I can tell only once has a 717 actually carried real fare-paying passengers - and this was solely so that it could be stated (in writing, and quoting a date and time) that the first train has started carrying passengers. *I was using my Visitors Oystercard (an early version without the white D in a blue box on its back) which now has a negative value of something like £6.50. I am minded to leave it in this condition 'forever' as I have viable alternative solutions and I received 'much hassle' trying to resolve the issue after failed card readers (somewhere else) caused this Oystercard to go into negative value a few months ago - of course if the GN 717 had run in passenger service as advertised then this scenario would not have come to pass. I have been looking for them on Real Time Trains (which shows 5xxx empty stock workings as well as class (1 and) 2 passenger workings, and on most Fridays no trains terminating or originating at Gordon Hill (2Gxx or 5Gxx) were to be seen. The penultimate unit of the class, 717024 is now on UK metals. Could it be possible that the whole fleet could swoop in on the May timetable change? Unlikely since some issues don’t become apparent until the trains enter passenger service. What would happen if they all had to be taken out of service again? I think they will all be in service before May, but it’ll be a gradual rollout. An informed comment on another forum suggests initial rostered workings may start in 10-17 days but that still has to be confirmed. The introduction will be phased not a big bang. I saw speculation that they start next Monday - 14th January! I am sceptical, because elsewhere I saw February, but in reality I suppose I should treat both as 'hearsay' until its officially denied. The Class 345's sort of slipped in to service almost unannounced, maybe the same will happen with the 717's? I simply shared what someone posted in good faith elsewhere. That person is only a driver on the relevant GN route so what would they know? What you choose to believe is up to you. The 'elsewhere' was not 'here'! Sorry but completely wrong. Siemens/GTR were contract to delivery the first passenger service in September and the first passenger service ran 28/09/18. Yes it was a preview service but it was a public accessible service. All preview services ended with the start of the December timetable change IIRC. As for introduction, there has never ever been a big bang plan. The plan is 3 diagrams introduced in phase 1. This is part of a slow run up. Big bang is a bad idea. There may be a single diagram introduced on the first day but expect a slow but steady fizzle in rather than fireworks. It also helps the 313s are required anywhere else so there is zero reason to rush this. Current plan is Monday 28th January (2019) but there a things that need signing off before then. Remember unions/ORR are all part of the puzzle and everyone must be satisfied prior to rolling them put in service. it might be an idea to keep an eye on the weather forecasts, earlier today I saw a long-range BBC weather forecast which hinted that we might have some snow by then. If we do it might affect the introduction of the train.